The Daily Sasquatch: Jesus, Santa Claus, and Thoreau. Jesus, Santa Claus, and Thoreau. The comparisons to Jesus and Santa have been made before and not all are nice. In fact there are more than a few books and websites that do nothing but expound upon the similarities of Santa to Satan and his usurping of Christ’s role in the world particularly at Christmas time. But what does a 19th century American essayist/philosopher/rebel have to do with either of them? The truth is, depending on your personal beliefs, nothing or everything. Contrary to popular belief I hold a degree in Religion. It is a degree that, though I enjoyed earning, means very little in the “real world.” I do not regret my decision in pursuing such a degree and I only make mention of it because I can’t help but notice that many of my friends that studied alongside me have all followed paths much different than my own. That is not to say I am alone in my beliefs, not at all. Simply that the community that I was part of whether through similarities of study, interest, disposition, or even convenience I no longer feel a part of. There is a restlessness of spirit that no amount of study of scripture was able to fix and which has at least in my private thoughts ostracized me from that community. Yet, there is no mourning on my part. Rather I feel as a prisoner let free from the confines of a prison. I have a newfound freedom that neither study nor experience has fully prepared me for. Yes, I know, as Socrates once said “I know that I know nothing.” Without getting into Greek semantics and syntax I first acknowledge that I do not possess all the knowledge that would allow me comfortably to make all the right decisions every single time. Also I am honest enough to say that even at times that I do have the required knowledge to make the right choice I may, for whatever reason, choose not to. This is I believe my right as a human to be able to choose. However it is my duty as a neighbor living amongst others and in a world that I share with others to choose to do right. Now again, what does Thoreau have to do with this? And Jesus and Santa for that matter? 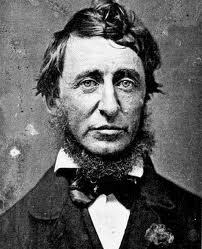 To me Thoreau stands as a rare ideal. Not in that his beliefs are mine though yes some of them are. What I see in Thoreau that I do not see in Jesus is freedom. I don’t mean to blaspheme here…or perhaps I do. I haven’t quite decided. Jesus; those teachings of his that are transmitted down to us are what I cherish and value. Yes I admit even those can never be fully accepted either without some amount of faith. Yet, even if those teachings are myth attributed to legend they are still very valuable and instructive. And were we still to assume that the Jesus in the scriptures is the real Jesus it is not hard to find many places where he has been taken up as an icon and idol to be worshiped blindly with little regard, if any, to his actual teachings. We seek salvation through gestures and prescribed readings while the evil in the world festers through indifference and a lack of courage to act. Santa is an even more perfect example though perhaps not as devastating as the empty Jesus. Here is a figure that represents all the good we would like to see in the world manifested precisely in the manner by which we prevent that good from being fully realized. The commercialism is a problem yes that distracts us from doing good unto others. However the general atmosphere does have the ancillary effect of promoting a spirit of goodwill that one finds less common in the general population on a daily basis outside of the season. The real problem I believe lies at the fact that it is the material goods that keep us from attaining that full awareness of the other. We do enough to appease our conscience and little more. What happens when the trees are taken down, the toys forgotten, the lights put away? 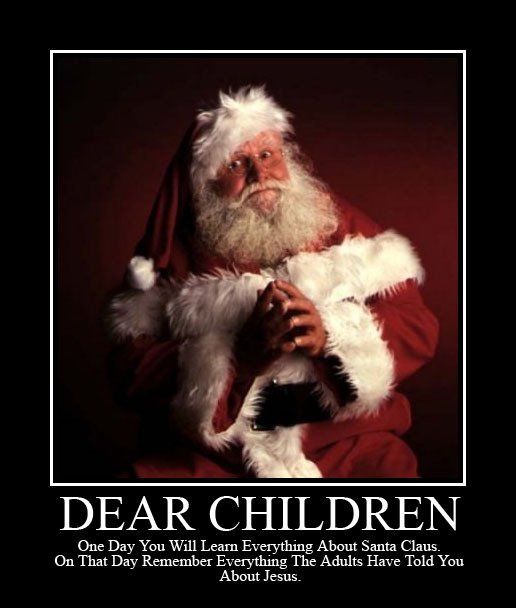 Is Santa that figure that promotes the good we are capable of beyond the season in ways beyond the material? Is he a leader or a myth we create and expand upon because it makes us feel good? Or does he represent more. Both the modern Jesus and Santa are to me of little import when discussing matters of good and evil simply because they are constructs of a society created to serve that society not the other way around. I am not saying that we should open a church of Santa (as funny as that sounds to me). Nor am I saying that to enjoy our traditions makes us an outright agent of evil. But it is very easy to get distracted and forget what is really important. And that leads me back to Thoreau. I don’t know what is really important and I am one of the biggest fans of our current Christmas season; to such a degree that I have been playing Harry for the Holidays since mid-September. Is that normal? Probably not. What I find appealing about Thoreau and others like him is the rebellious nature. He questions as easily as he breathes, and I suspect that to him it is just as necessary to existence. I love the freedom of thought, to challenge an idea and not fight against the friction created by the reproach of centuries of orthodoxy. The God I choose to believe in does not look down on this freedom of thought, but rather encourages it. How can we better understand his greatness if we are not allowed to discover all that we don’t know? Gus Victoria. Awesome Inc. theme. Powered by Blogger.